Never in my entire life would I have ever imagined to make a dragon out of cake, but hey, there’s a first for everything! Although I do have to say this was an awesome project that we encountered upon a few weeks ago. We were asked by a gentleman to create the dragon from the movie The Hobbit. He stated that he needed it for the celebration of the end of the Scarborough Renaissance Festival in Waxahachie, TX. Per usual, challenge accepted! We had began the planning stages of creating Smaug the dragon. We took 3 days to look up detailed pictures and descriptions of Smaug, just so we had the perfect replica of him. I was seriously loosing my mind with the different ways of creating him. It got to the point, that I dreamed of smaug talking to me while creating him here at the bakery. 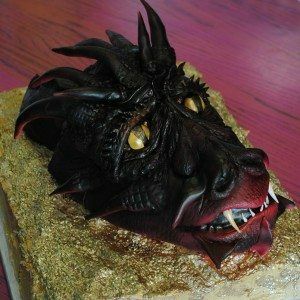 YouTube and Google had become our best friends that entire week watching people make their dragon, and most importantly, finding tips and tricks on the ways to do certain techniques. I do have to say that the gentleman chose hazelnut pound cake for this flavor, and YES it helped tremendously. Pound cake is heavier than regular cake, making it more sturdy. 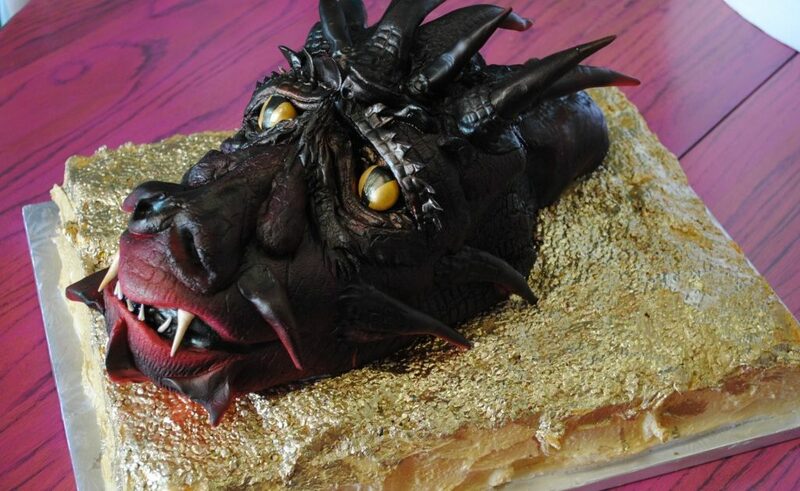 The next day we began covering Smaug with the fondant, using a crocodile skin to make the scaly look to his face. After doing so we left him for 2 days to set and let the fondant to take shape and basically become hard. On Thursday night, we had make the horns and nose, Friday morning we attached them and then began the airbrushing stage. We only used black, red, and parts of gold coloring to create his different shadows, and his special spots as you see in the picture. Also the same afternoon, we had used colored edible sequins to make the gold coin look that his head is resting upon. When the gentlemen ordered the cake, he stressed to us that he was to be “protecting the gold.” As he asked, we fulfilled his wish. Early Saturday morning, we had inserted his eyes and teeth to add the finished touches in order to make him come alive. We set Smaug on the cake that morning right before he was picked up and taken from us. This may sound very odd and hard to understand, but when creating a character, you somehow become friends with it over the course of time that you spend with it. The dedication and critical thinking that takes place, you would think, “Oh it’s just another fun project we were asked to do!” But in fact, you learn so much about yourself and your colleagues when working as a team to make the final product turn from a dream or idea to reality. We hope you enjoyed this post! Don’t forget to follow us on our social media platforms!